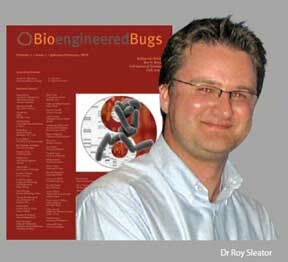 Dr Roy Sleator, a lecturer at CIT’s Department of Biological Sciences, has been appointed to the position of Editor-in-chief of a new peer reviewed scientific journal named Bioengineered Bugs published by Landes Biosciences, Austin, Texas . Sleator heads-up an International Editorial Board including Dr J Craig Venter (J Craig Venter Institute, Rockville Maryland, USA ), a pioneer of genomic sequencing and one of the key scientists involved in sequencing the human genome. Another notable member of the board is Prof Ananda Chakraborty ( University of Illinois at Chicago ), the first scientist to patent a genetically modified organism, following a landmark case held in the US Supreme Court in 1980. The purpose of the journal, which was officially launched in January 2010, is to highlight the most recent and significant advances in the development of genetically modified organisms for food, pharmaceutical, medical, industrial, environmental and bio-defence applications. Bioengineered Bugs will provide a platform for publishing high quality research on any aspect of genetic engineering which involves the generation of recombinant microbes for beneficial applications. Initially, the journal will appear bimonthly, incrementally increasing the frequency to 12 issues per year. Each issue will appear in print and online and will be PubMed/ Medine and ISI indexed. The BIO-EXPLORE research group is a team of inter-disciplinary scientists from the Departments of Biological Sciences Chemistry and Maths & Computing. The team is committed to developing and implementing platform technologies to underpin its core research areas of diagnostics, bio-analysis, antimicrobial screening, bio-informatics and peptide engineering.